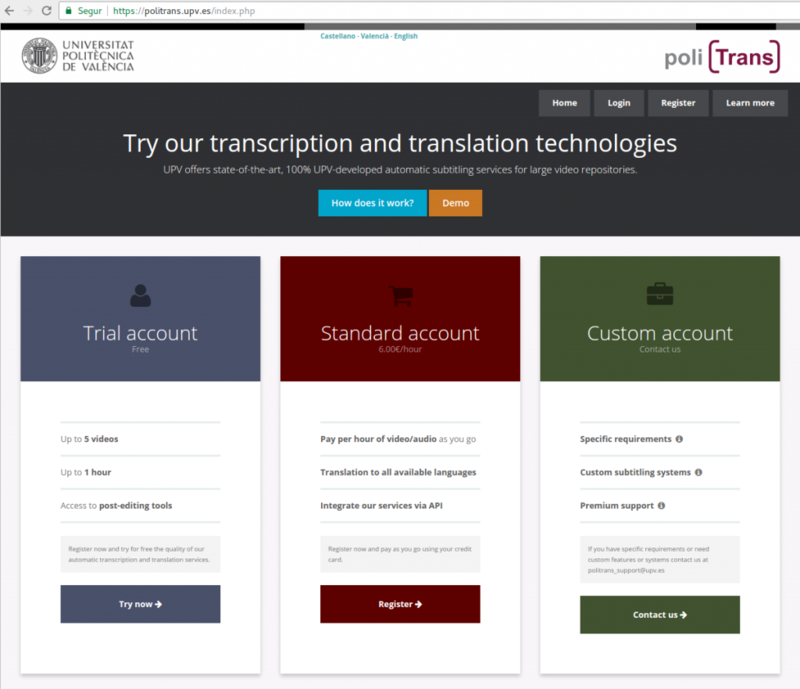 Universitat Politècnica de València has just launched poliTrans, its new service for automatic video transcription and translation. Powered by MLLP technology, this new service is now available for use by any interested university or organization. Universitat Politècnica de València (UPV), one of the main technological universities in Spain, has for years been a pioneer in the production and use of video lectures for education, with its own system poliMèdia. Now UPV is launching poliTrans, its official service for automatic video transcription and translation, for use by any interested university or organization. poliTrans is an online platform for automated and assisted multilingual media subtitling offered by UPV and its Information and Communication Systems Service (ASIC). Using state-of-the-art systems developed 100% by the UPV’s Machine Learning and Language Processing (MLLP) research group, poliTrans adapts to the user’s videos for enhanced accuracy, going beyond what generalist speech recognition systems can provide. By opening a poliTrans trial account, you can try uploading your own videos. poliTrans will transcribe your videos in their original English, Spanish, Catalan or French language, and translate the subtitles to the other languages*. You can then post-edit the automatic subtitles using the TLP Subtitle Editor, an advanced media player enabling side-by-side post-editing of multilingual subtitles. poliTrans also offers a comprehensive web service and API that can be used to automate the tasks for large video repositories and integrate these services into your organization’s media workflow. Just visit the poliTrans FAQ to find more details about it. The UPV has been using poliTrans internally since 2014 to generate subtitles in a cost-efficient way for its institutional video repository (so far, 18392 videos, 3622 hours), with Universidad Carlos III de Madrid being another prominent user of this technology. Now any other university or organization can easily use the service, with a pay-as-you-go model, for their own media content. Visit politrans.upv.es to open a trial account and start trying it with your videos. *Other languages, such as German, Italian, Portuguese, Dutch, Slovene or Estonian, can be made available according to demand.